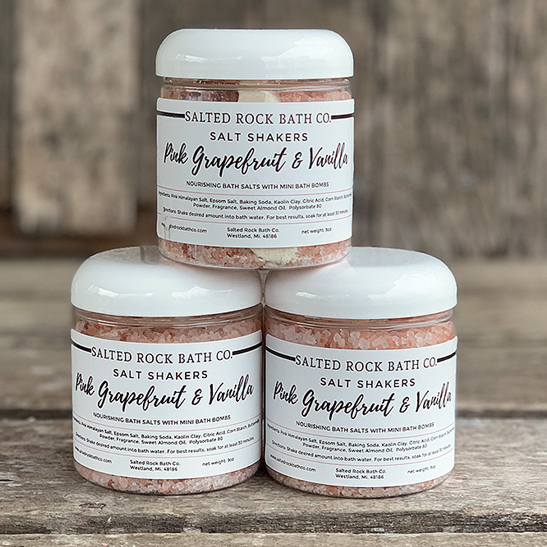 pink grapefruit and vanilla salt shakers – Salted Rock Bath Co. Pink Grapefruit & Vanilla Salt Shaker is made with Pink Himalayan Salt & Epsom salt. Both salts are thought to be good for sore muscles and irritating skin conditions such as eczema, acne and dermatitis. Pink Himalayan salt is packed full of minerals and helps to replenish and recharge. The mini bath bombs contain sweet almond oil which moisturizes deeply and buttermilk which is thought to help rid impurities from the skin, lighten dark skin spots and is a gentle cleanser. It’s scented with a refreshing blend of pink grapefruit essential oil and fresh vanilla. 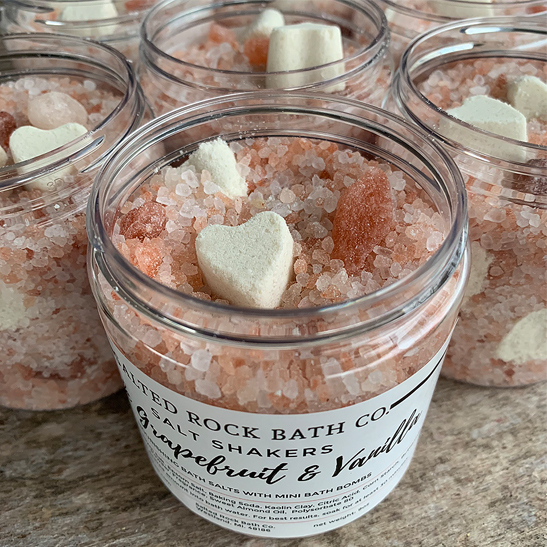 Each jar is filled with 9 ounces of premium salt blend and 8-10 mini bath bombs. Salt Shakers are a luxurious bath treat that let you enjoy the benefits of both a salt soak, and bath bomb. Traditional salt soaks help purify as they draw toxins and dirt from the skin. Salts are also thought to balance skin moisture, reduce muscle pain and improve the circulation of lymphatic fluid. Bath bombs are super fun, but also very therapeutic as they release skin nourishing oils and other ingredients into the bath water which help hydrate, heal and replenish skin. The Blend: Pink Grapefruit & Vanilla is made with Pink Himalayan Salt & Epsom salt. Both salts are thought to be good for sore muscles and irritating skin conditions such as eczema, acne and dermatitis. Pink Himalayan salt is packed full of minerals and helps to replenish and recharge. The mini bath bombs contain sweet almond oil which moisturizes deeply and buttermilk which is thought to help rid impurities from the skin, lighten dark skin spots and is a gentle cleanser. The Scent: A refreshing blend of pink grapefruit essential oil and fresh vanilla. Directions: Shake desired amount into bath water. For best results, soak for at least 30 minutes. Pink Himalayan Salt: One of the purest salts available and very rich in minerals including calcium, copper, iodine, iron, magnesium, manganese, phosphorus, potassium, selenium, sodium and zinc. Thought to be the best salt to use as a soak as it minerlaizes and detoxifies our skin and bodies. Pink Grapefruit Essential Oil: Energizing citrus oil used for aromatherapy and also thought to be naturally antibacterial, stress reliever, and cleansing. Sweet Almond Oil:Vitamin E & A work to keep skin cells healthy, reduce acne and protect from UV rays. Thought to help skin retain moisture and heal dry,chapped skin. Buttermilk: Cleopatra was said to bathe in buttermilk as its thought to soften skin, brighten age spots and tighten skin. Epsom Salt is used often for home treatment of sore muscles and arthritis pain. It is made up of magnesium and sulfate, so thought to be great for eliminating toxins, and boosting magnesium levels.